That’s what Lynda Hartigan, deputy director of the Peabody Essex Museum, says she expects many visitors to think when they see the garments on display in the museum’s “WOW® World of WearableArt.™” Hartigan curated the exhibition, which opens on Feb. 18. Three shows in the area this winter will likely prompt that question. That’s the canny trick of wearable art: It makes us think about art in relation to our own bodies, sometimes in uncomfortable or hare-brained ways. “WOW®” highlights the outlandish concoctions of a host of international designers, artists, and others who made a splash in the annual wearable art competition in New Zealand for which the show is named. The aim: to be as creative as possible, using the body as a canvas. Many of the “WOW®” outfits are pure fun, but some have unexpected depths. Hartigan points to Marjolein Dallinga’s “Skin,” a spiky red ensemble made from felted wool and silk. Notably less protective is Lauren McCarthy’s “Happiness Hat,” in the “Body Politic” exhibit at OPEN, a new gallery in the leather district: When it senses you’re not smiling, it pricks you. And, at “CODED_COUTURE” at Tufts University Art Gallery, “Holy Dress,” from Melissa Coleman, Joachim Rotteveel, and Leonie Smelt, is wired with a lie detector and a shock-training dog collar. It’s fun to picture certain politicians outfitted with similar gizmos. Couture, traditionally, is handwork that makes a garment unique to its wearer. “CODED_COUTURE” extrapolates custom design to include fashion that springs from different types of coding, genetic to digital. “In this me-me time, when we’re all the stars of our own reality shows, this is part of the movement of personalization,” says co-curator Judith Hoos Fox. 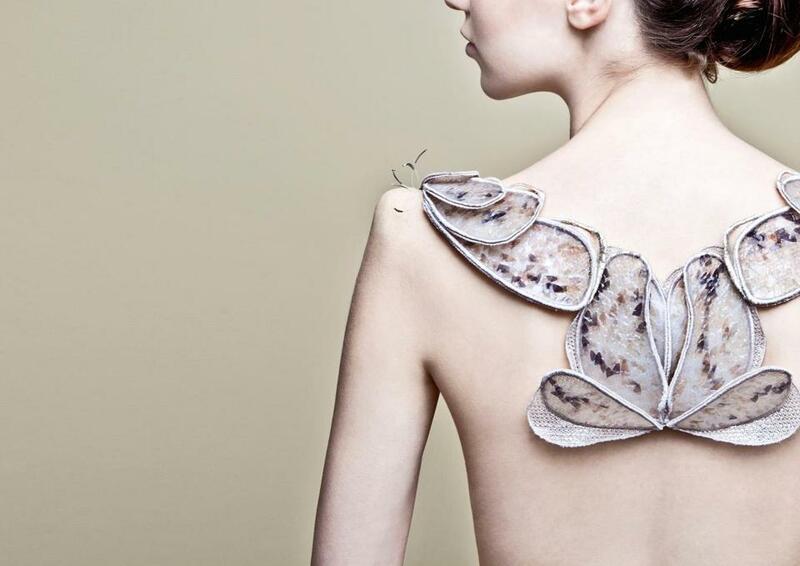 Imagine wearing Amy Congdon’s) designs for jewelry grown from your own skin cells. The November election inspired the distinctly dystopic “Body Politic.” Curator Laura Zittrain tapped mostly women and artists of color to explore fashion as a means of resistance; the show also takes on OPEN’s mission of showcasing art that critiques the relationship between society and technology. 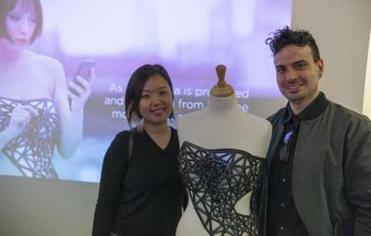 Xuedi Chen and Pedro Oliveira’s “x-pose,” for instance, is a bodice that grows more transparent every time the wearer uses Google — and Google gathers information about the wearer. The intersection of technology and fashion is red-hot. Last year, two major exhibitions addressed it: the Museum of Fine Arts’ “#techstyle” and the Metropolitan Museum of Art’s “Manus x Machina: Fashion in an Age of Technology.” “CODED_COUTURE” and “Body Politic” extend the trend. Some works examine the complicated role fashion plays for women. In contrast, “emPowered,” Brittany Cohen and Emmeline Franklin’s dress shown in a video at “Body Politic,” invitingly unlocks a shoulder strap when the wearer takes on a power pose. The garments in “WOW®” have less utility, but perhaps more heart. David Walker, a carpenter from Alaska, designed “Beast in the Beauty” as a tribute to the dignity and beauty of women with cancer. His late wife, who died of breast cancer, collaborated with him. Walker weaves symbols throughout the piece, such as pink laces on the boots to denote breast-cancer awareness. 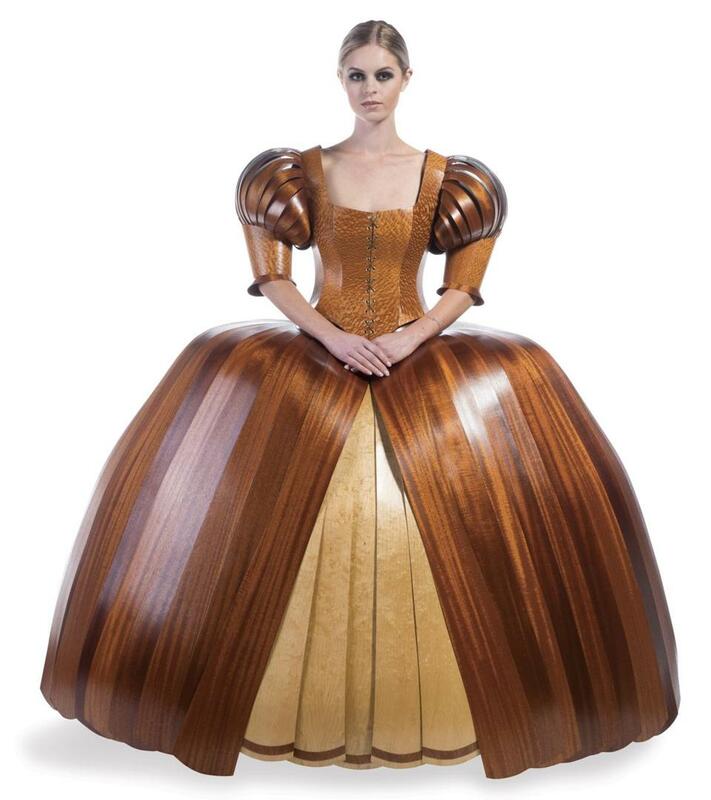 While the all-wood “Beast in the Beauty” sounds more like sculpture than fashion, one of the aims of the show, Hartigan says, is to celebrate “the category-busting.” Besides, “Beast in the Beauty” is indeed wearable. Cate McQuaid can be reached at catemcquaid@gmail.com.